• Coil options that include interchangeable low power, high power and explosion-proof versions for expanded configuration flexibility. 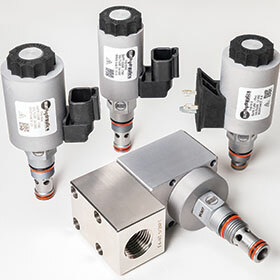 FLeX valves offer significant performance advantages over competitive valves. For example, the FLeX DTBF normally closed, direct-acting blocking poppet valve, like all the FLeX valves, was designed with advanced computational fluid dynamics (CFD) simulation tools to optimise flow path geometries. It is coupled with a solenoid actuator that provides optimised actuation force at critical points in the valve stroke. The result is a lower pressure differential across the valve at a given flow rate and increased shift performance at higher pressures and flows. In practice, this means hydraulic systems utilising the DTBF valves will see significant improvements in both efficiency and reliability while providing higher pressures and flow rates than competitors’ products.